Fear. Stress. Boredom. Language learning can stir up a host of negative emotions. One minute you’re yawning over a grammar book and the next you’re cowering under the table for fear of sounding like a cross between a 2 year old and Tarzan. These bad feelings are bad news for language learners, because negative emotions like stress and boredom can wreak havoc in your brain and make it more difficult to learn and remember new things. When our brains detect a stressful situation, the hypothalamic–pituitary–adrenal axis (that’s a system of glands that release hormones, not an 80s hair metal band) pumps out stress hormones, like cortisol. These stress hormones stimulate the fight or flight response, which came in very handy when we were living in caves as they helped us react quickly to threats, like saber-toothed tigers. Even today, small amounts are good as they keep us alert and focused on the task at hand. But large amounts of these hormones suppress systems that aren’t deemed important for survival, like the ability to learn new information. And when you think about it, learning to conjugate a French verb probably isn’t all that important when you’re being chased by a tiger. Our problem is that we’re learning a language, not running away from big cats, and too much stress gets in the way of this learning process. Studies show that people under stress have difficulties learning new words, which is linked to an excess of cortisol (Kuhlmann et al. 2005). Cortisol interferes with an important learning and memory centre in the brain, the hippocampus (which, alas, does not look like a hippo, but more like an upside down seahorse). It also stimulates the amygdala, the part of our brain which deals with emotions like fear. Psychologist Daniel Goleman (2006) explains that too much cortisol focuses our attention on the emotions we feel and limits our ability to take in new information. Excessive stress can cause a whole of host of problems for learners like the shrinking of the prefrontal cortex – the part of the brain that regulates concentration, amongst other things – and fewer new brain cells being generated (Radley et al. 2004; Chen et al. 2008). At this point you’d be forgiven for wondering why you chose such a strenuous hobby, instead of a lovely relaxing pastime like crochet or baking cupcakes. The good news is that language learning also lends itself very well to positive learning experiences like fun and laughter. And research shows us that by capitalising on these positive emotions, we can enhance our ability to learn new information. French teacher Alfred Mercier once said what we learn with pleasure, we remember. Positive emotions boost our performance in a variety of areas including problem solving, learning, memory and verbal fluency. 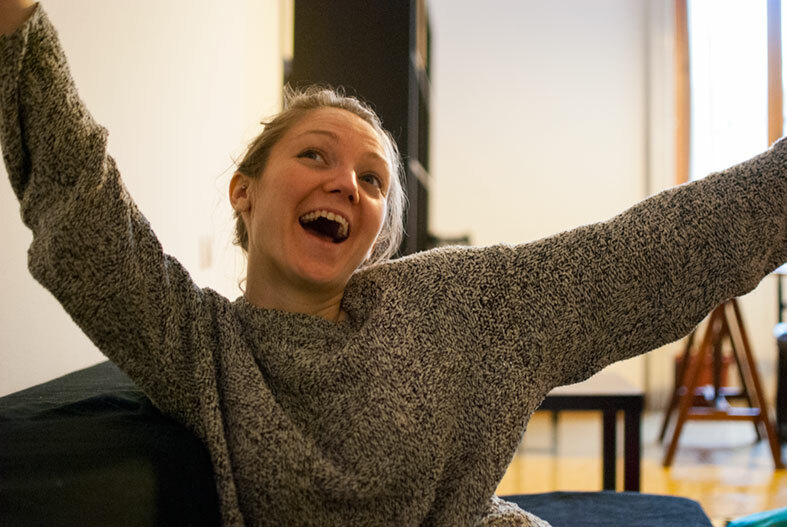 Scientists believe that this positivity advantage comes in part from increased levels of dopamine, a neurotransmitter sometimes described as “the feel-good chemical”. – explicit memory (when you memorise new words or grammar rules). Neuroscientist Martha Burns describes dopamine as “the save button” of the brain. When we learn something, the brain encodes the new information through neuronal connections, known as synapses. Burns says that the presence of dopamine strengthens the connections between synapses, making the new information easier to remember at a later date. This means that when we learn in a way that’s fun and rewarding, not only do we feel better, we learn better too. One of the best ways to keep our brains receptive to learning is laughter. Studies of university professors reveal that using comedy in lectures helps students understand and remember the material better (Garner 2006). Laughter reduces hormones that inhibit learning, like cortisol, and activates regions of the brain associated with dopamine release (Berk et al 1989, Mobbs et al. 2003). Injecting humour into language learning reduces anxiety, increases motivation and helps things stick. It’s time we started taking fun more seriously. To turn our brains into learning powerhouses, we need to develop strategies that help us manage negative emotions and learn with more enthusiasm and laughter. 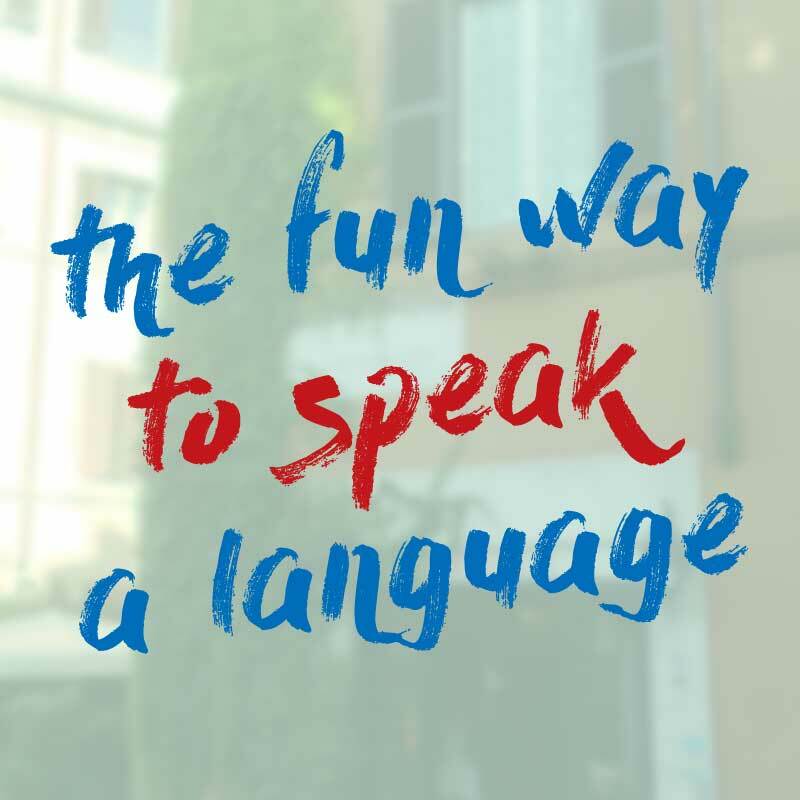 With this in mind, here are 13 ideas to make language learning less stressful and inject some fun into the process. We language learners take ourselves far to seriously. Sometimes, we’re so worried about making mistakes that the idea of speaking causes lots of anxiety. But with the right attitude, mistakes are a perfect opportunity to lighten up and have some fun with native speakers. Many of my friendships with French and Italian speakers have been solidified by us laughing tears over something ridiculous I said by accident. Over the last few years there’s been an explosion of online games which help you learn a language and have fun at the same time. Two of the most popular, duolingo and memrise, are available as apps, so you can download them and learn a language instead of playing candy crush. Languages don’t always follow logical rules. And even when they do, the rules sometimes feel out of reach as our brain isn’t ready to pick them up yet. Trying to grasp everything at once creates tension and gets in the way of learning. Accept that some things are still a mystery and they’ll be revealed little by little as you continue learning. When you approach languages with patience and curiosity (and don’t stress about what you don’t know yet) you’ll learn much faster. You know those days. When your brain just says eff it and sabotages all of your good intentions to study. These days are risky, because once you miss one session, it’s easier to skip the next one, then you start to feel guilty and it’s hard to get back on the study train. My secret weapon for these days (which happen pretty often) is to let my brain chill out by doing “lazy” activities in my target language, like watching TV, films or listening to music. If I’m feeling inspired, I might look up the odd word or grammar point that comes up, but I don’t force myself to do anything strenuous. This way I can stay on the study train without stressing myself out. What do you enjoy doing in your native language? Whatever it is, try doing it in the language you’re learning. If you like going to the pub, set up a language exchange at the pub. If you like reading news websites, find one in your target language and use the google translate add-on to quickly translate new words. If you like watching TV, look for similar programmes in your target language. If music’s your thing, try finding a group you like and translating the lyrics. Finding resources you enjoy is essential for bringing a spirit of fun to your learning. Learning grammar and vocabulary in an abstract way can be frustrating because it’s difficult to see how they will be useful to us in the real world. Whenever you learn a new word or grammar point, make it more concrete by linking it to real things and situations in your own life. Too high and it’s frustrating, too low and it’s boring. When choosing resources, try and find that sweet spot where the learning flows easily: materials should reinforce what you already know and throw in a few new things without being overwhelming. Graded readers are great for this purpose as they’re specially designed to introduce a little new vocabulary and grammar at each level. Routines are good as they help us work consistently. But ruts are bad, as they mean our minds aren’t stimulated enough. Shake things up every now and then by using the language in new ways. Visiting the country is a great way to do this, but there are plenty of ways to get new stimuli at home too. A few examples are language exchanges, joining a meet up group, writing a diary or recording yourself speaking. If you’re using a textbook or course that stresses you out or bores you to tears, change it! Often it’s the resources that are causing tension, rather than the language learning itself. There’s a right way for everyone to learn, and sometimes you have to experiment with a few different methods before you find yours. That said, be careful to avoid shiny object syndrome, where you keep collecting resources and not using any of them! Aim to find the right balance between trying new things and getting stuff done. Music is a well-known dopamine booster and is great for learning a language in a fun and stress-free way. Learn the words to some songs in your target language and listen to them whenever you can. You can even sing along while you’re in the car or cleaning the shower! When you’re practicing speaking, some people will stress you out more than others. It’s normal. Try and spend as much time as possible with people who make you feel relaxed and comfortable. Italki is a great place to find like-minded language partners and patient teachers. I tend to speak in a slightly higher pitch when I’m speaking another language, which is probably because I feel a bit tense. I find it helps to breathe steadily and focus on bringing my tone closer to my native one. I don’t always remember, but when I do it makes a huge difference as I feel much calmer and my speech flows better. Levels of dopamine increase in response to things that we know lead to rewards. For example, smelling cookies boosts dopamine because we know that the smell is usually followed by eating cookies. Neurologist Judy Willis says that giving yourself little treats at the end of study sessions helps your brain associate studying with rewards, boosting dopamine and motivating you to study more. Do you find language learning stressful sometimes? What do you do to relax? Which of the above tips do you think would be the most useful in your own language learning? Chen Y, Dubé C, Rice CJ, Baram TZ (2008) Rapid loss of dendritic spines after stress involves derangement of spine dynamics by corticotropin-releasing hormone. Journal of Neuroscience, 28. Goleman, D. (2006) Social Intelligence: The New Science of Social Relationships, Bantam Books. Kuhlmann, S., Piel, M., and Wolf, T (2005) Impaired Memory Retrieval after psychosocial stress in healthy young men. Journal of Neuroscience, 25. Katie is a teacher, blogger and all round language nerd. Based in Milan, Italy, when she’s not huddled behind her desk writing or learning languages, you’ll probably find her sitting out on the terrace with a beer in one hand and a slice of pizza in the other.